Following celebrations for the 100th Anniversary of Dada, ARCUS artist-in-residence Yen Noh examines Dada in Japan and the contemporary relevance of absurdity as a form of resistance through the radical Mavo movement, which literally hurled stones at the establishment. Shocked at the lack of canonization of Mavo in Japanese art history, Noh considers the processes by which knowledge is archived and distributed with a temporary library (created with books contributed by participants) and used as a research space in a series of workshops and talks, including a panel discussion on November 26th. From November 11th-27th. Just as Japan looks to expand its“foreign human resources,” curator Ko Nien-Pu presents an exhibition of work at Tokyo Wonder Site by four artists from Taiwan, Japan, Korea, and Malaysia,who attempt to excavate the scars of colonialism and dissect the post-colonial body. Taking its starting point from the 1946 Shibuya Incident, an uprising of Taiwanese“Third Nationals”stripped of their citizenship from former Japanese colonies against local Japanese gangs and the police, this exhibition questions through the work of Hikaru Fujii, Kum So-Ni, Kao Jun-Honn, and Au Sow-Yee the violence of invisible borders and the stamps of belonging branded upon the land and the body. From November 26th-December 12th. A pioneer of Chinese noise and a flag-bearer of the Chinese experimental music scene, Yan Jun has enjoyed a prolific career with a strong international network, dedicated local base (seen in the ten-year project Waterland Kwanyin), insatiable thirst for improvisation and recording, and continued drive to get new artists “out there” with the Mini Midi sound festival. Having fostered strong ties across East Asia, including Japan, and having worked with the likes of Otomo Yoshihide, Keiji Haino, and Eye Yamataka, he presents his first exhibition in Tokyo with a new installation at 20202 highlighting the multi-faceted spectrum of his creative talent, which on this occasion turns from noise to the sound of silence. Through November 26th. We hear on a daily basis of the shrinking ice shelf, rising water levels, and the impending extinction of vast numbers of animals, but how will this increasingly real danger impact our daily lives? With ever-growing cases of erratic weather, it appears we shall have to confront these issues sooner rather than later, but perhaps we may draw on technology from the past for ideas about how to survive the present and future. Examples of this technology include mizuya and mizuzuka, structures with long traditions in regions of Japan frequently subject to flooding. Based on the principle of raising buildings above flood levels through a significant height of stone walling, many of these structures remain today and are featured here at LIXL Gallery in a collection of photographs, photographic models, and associated farming tools. As nature is increasingly unpredictable, this exhibition calls upon us to re-examine the Japanese history of design, which allows for co-habitation with the unswerving forces of rivers and rainfall. Through November 26th. With a photographer’s eye Shunsuke Kano brings into question the very act of looking by playing upon our sense of perception and weaving between the physical and flat world. Having recently enjoyed increasing spotlight in the art world through his selection for the 8th Shiseido Art Egg (2014) and the co-production of the art book “The Copy Travelers”, he here builds upon his long examination of material, line and composition to place worlds within worlds with his own unique touch of humor. Continuing his interest in construction and urban development here his series observe the transformation of the city spaces of Singapore. Ends December 11th. Photographer Shigeo Gocho was a member of the Con-pora contemporary photography movement of the 1970s. Through the camera he spent his short life exploring the strangeness of human existence and the limits of knowing oneself and others in somber, ethereal images of children and street scenes captured with a perspective that comes across as haunted as it is haunting. Fujifilm Square hosts a retrospective small in scale but high in the quality of its selection through December 28th. “The Anatomy of Colors” at the Meguro Museum of Art looks at color as an expression of not just art, but archeology, anthropology, and history. Focusing on pigments used in Edo-period Ukiyo-e and Kunie-zu (artistic regional maps created for the Tokugawa shogunate), this MuPon-eligible show draws on the latest research to spotlight the technical expertise and societal influences that produced these hues, themselves a kind of cultural artifact. Ends December 18th. Monk, poet, and artist Sengai Gibon (1750–1838) brought the teachings of Zen Buddhism to the masses with delightfully playful, sometimes puzzling abstract ink brush painting that retain their warm and light-hearted charm to this day. The Idemitsu Museum of Arts showcases its premier Sengai collection along with works from the Fukuoka Art Museum, Kyushu University, and Fukuoka’s Shofuku Temple where Sengai once served as head abbot. Through November 13th. (MuPon). Yukinori Yanagi is an artist you may not know but should. He first made a name for himself at the 1993 Venice Biennale with ‘The World Flag Ant Farm,’ a series of tube-linked displays in which live arthropods burrow through layers of colored sand arranged in the designs of flags, making a scramble of national identity and reminding us of our interconnectedness. Other Yanagi works include Inujima Art Project, for which he converted a former copper refinery on the island of Inujima into an art museum and monument to Japan’s industrial modernization. “Wandering Position” at BankArt Studio NYK in Yokohama traces Yanagi’s many creative paths with pieces from some of his most famous series and new Godzilla-focused work. Through December 25th. Having pursued a concern with memory, history, and the notion of the soul throughout his career, internationally famed French artist Christian Boltanski presents his first solo exhibition in Tokyo hosted at the Tokyo Metropolitan Teien Art Museum. Shifting between mediums of sculpture, painting, film, and photography over his career of some sixty years, Boltanski has continuously found new ways to conceptualize themes of presence, absence, and loss. 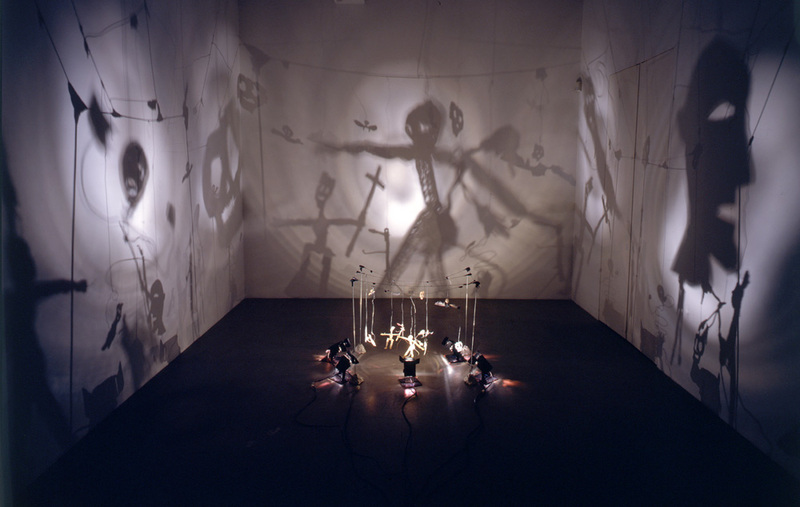 “Animitas – Les âmes qui murmurent” (Souls Who Murmur) embodies these ideas in multimedia installations of light, shadow, and sound. Ends December 25th. (MuPon).